Thanks to all the people who emailed and commented about my friend Edna. She passed away this morning. I like to think that she is still pedaling her bike somewhere, in a place where all the hills are downhills and all the winds tailwinds. She was a great and generous spirit, and I will miss her. In addition to deciding what colors to dye, I also need to decide what combinations of colors to use, since there are two warps and two wefts. I think I will start with black and blood red, then go to brick and scarlet, and shade from there through orange and gold. I will have to do some more color simulations in Photoshop, but in the end the only way to really know what happens is to weave it. I hope I get it right! I also need to think about the draft. Each of the flames will be quite narrow (3″ max) and will run along the diagonal. This means that, with my current draft, the “heat waves” will appear to run vertically. This would look awkward in a wider strip, but will it make a difference in such a narrow strip? I don’t know. Another thing for which I need to sample. It shows a color-gradient fabric cut on the bias. 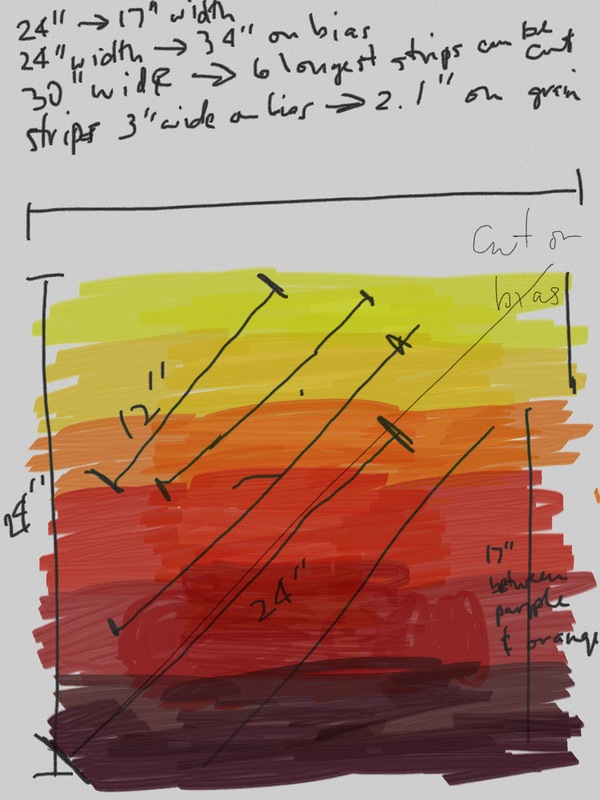 I want a 24″ strip of fabric for the longest flame, which means I need a color gradient from orange to reddish black that happens over a space of twenty-four inches, when cut on the diagonal. Doing the math, that means I need a square 17″ x 17″, which will produce a 24″ diagonal. A bit more math suggests that each color transition should be about four inches long. There is more math to be done, none of it hard, but in the end it boiled down to seven yards of warp: one yard each for five color-gradient sections, plus one for loom waste and one for sampling. Once I have it all wound, I will have to stretch it out and tie it in the precise and convoluted method I used for the color study. I am not looking forward to that, but it will have to be done. And once that is done, I will need to knit blanks and dye the weft! This is truly going to be a labor of love. 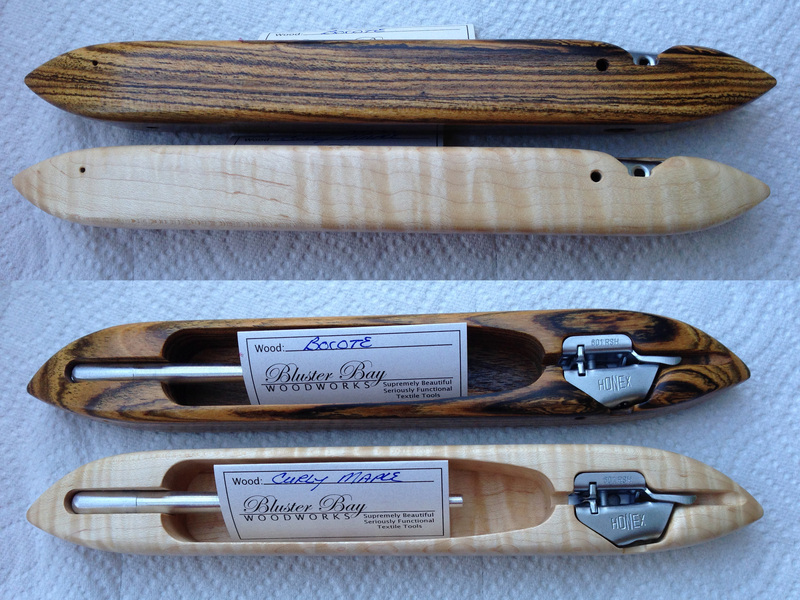 The grain and figuring are beautiful – the bocote reminds me of tiger eye, my favorite gemstone. And of course they are joy to use – I’ve tested them out already! 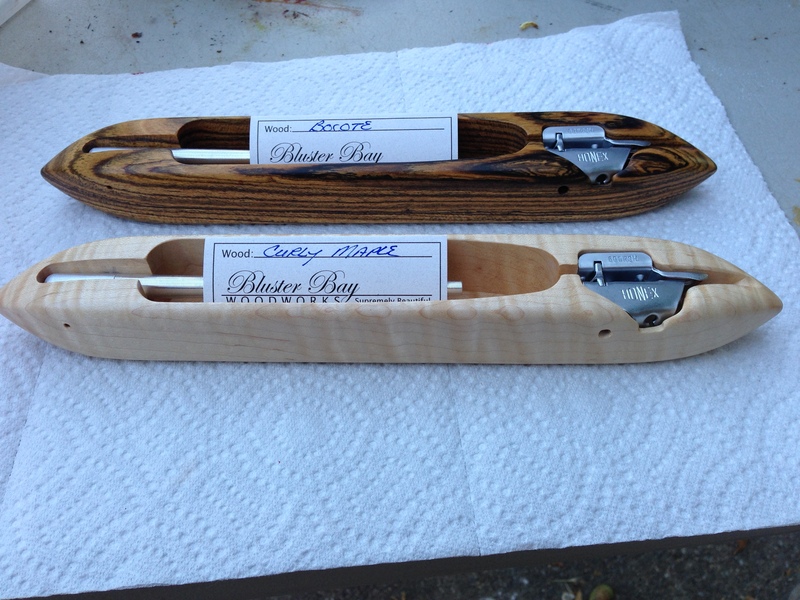 That brings my stock of Bluster Bay end-feed shuttles to six, which is way more than any weaver needs. But they are such beautiful shuttles, it’s hard to stop collecting them! And, finally, here is a picture of Fritz the Mighty Warrior, engaged in mortal combat. 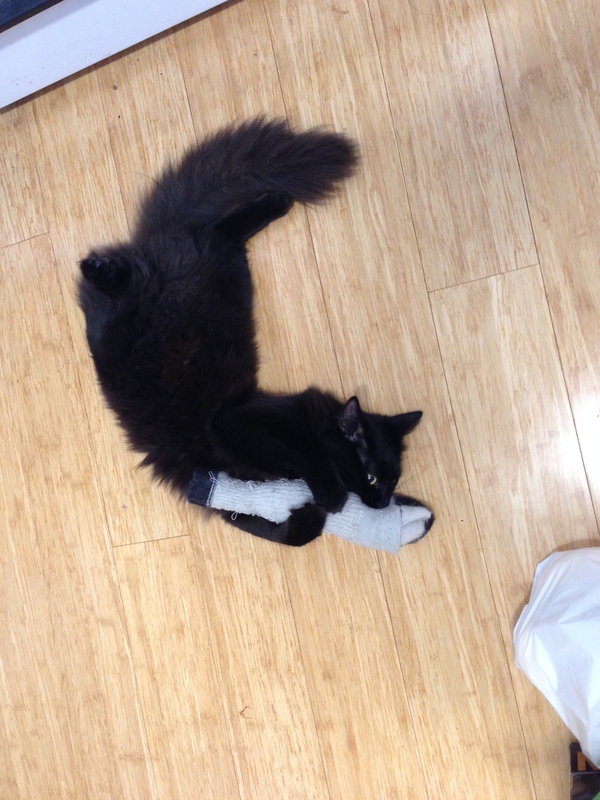 Is it possible to look adorable, fierce, and downright silly at the same time? Maybe not for an ordinary cat, but the inimitable Fritz does it with ease. So sad. My heart goes out to her family and friends. I am so sorry to hear about Edna. Bicyclers hold a special place in my heart. Condolences on the death of your friend and biking companion. Downhills and tailwinds: what a lovely eulogy. I’m sorry about the loss of your friend–my condolences.